As I mentioned in my 17 Week Pregnancy Update, on Thursday Andy and I went on a Spa Date to the Thermae Bath Spa and for dinner at Gascoyne Place in Bath. Despite living in Bath for 10 years, we had never been to either places before and we had really been missing out! 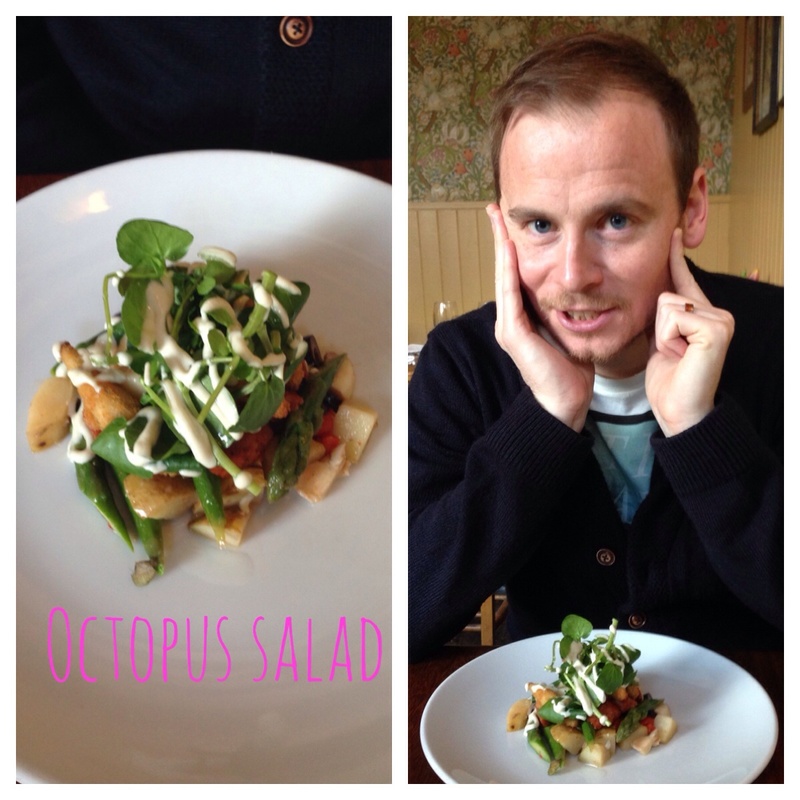 For starter, Andy had an Octopus salad with Whitebait, Jersey Royals, Chorizo, Asparagus and Bagna Cauda Dressing. I wasn’t keen to try the octopus as I am a big wuss and not very adventurous with certain food. He throughly enjoyed it and there wasn’t even a smidge of sauce left on his plate. 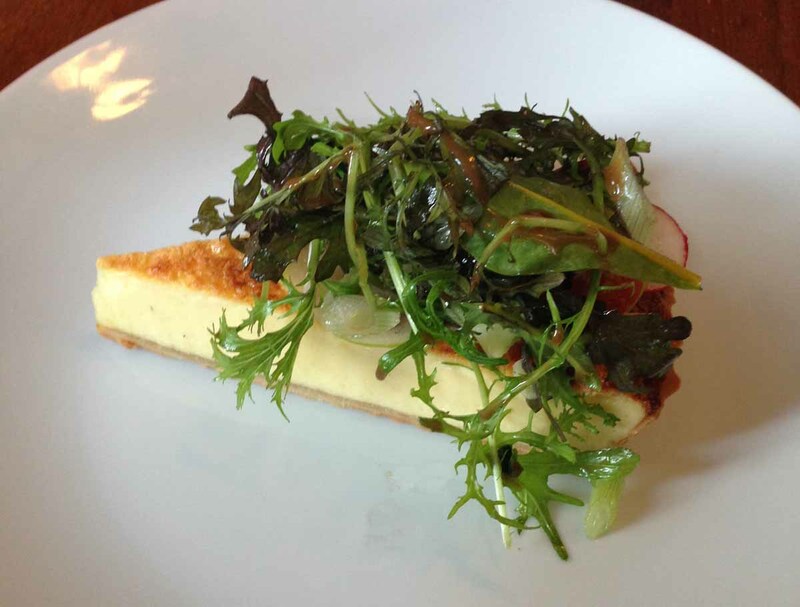 I had a very generous portion of their cheese tart to start with apple slices and salad. If this had been served in a deli it would have been the same size as a quiche on their lunch menu. It was safe to say that I was very full after the delicious entrée. I can’t remember the variety of cheese, I think it was Westcombe Cheddar but it wasn’t pungent or overpowering and well balanced by the tartness of the apple and crunch from the radish. 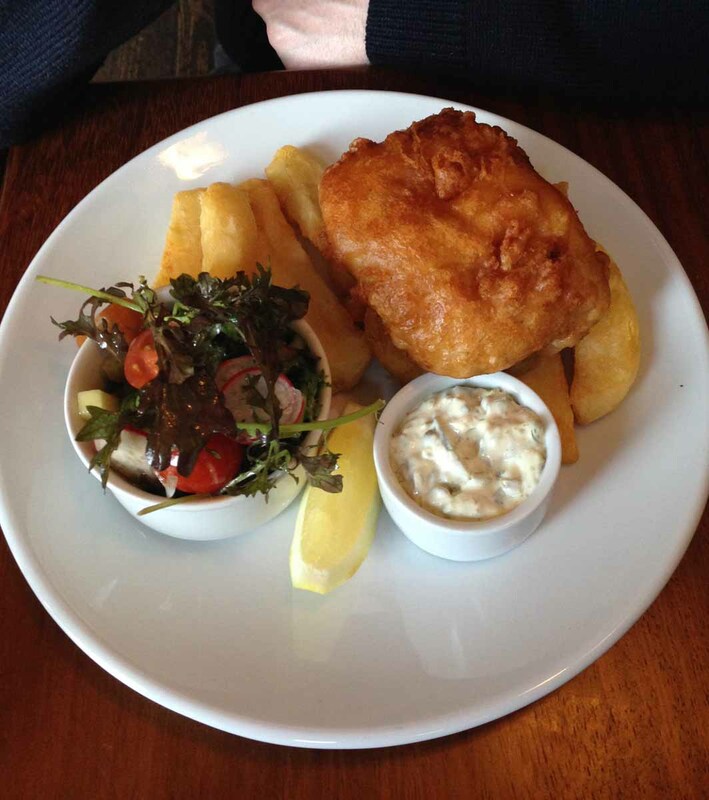 Andy ordered the Beer Battered Hake with chips, pea salad and tartare sauce. This was so nice that he kindly swapped his main with my burger and chips as he saw how much I enjoyed it. To be fair, I couldn’t manage much of his dish as I was so full after my starter. 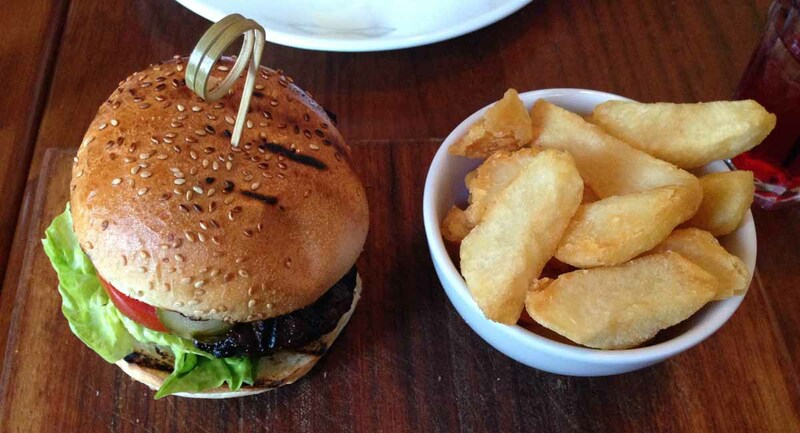 I had a beef burger with gherkins and salad, twice cooked chips and garlic mayonnaise. It looks quite small but it’s deceptive and Andy and I nearly skipped on dessert as we were so full. But I did say nearly… We rarely skip dessert as we love it so much! After digesting for a while, well actually a long while, we shared the white chocolate panna cotta with rhubarb crumble and rhubarb espuma. I really wish I had a picture to show you as it was one of the best desserts I’ve had in years. We got a bit too excited to try it as we’d never had espuma, a frothy gel of sorts, before. It’s safe to say that most of the dessert had gone before I even remembered that I needed to take a picture, sorry!